Look closely at this lovely printable scrapbook paper and you'll see butterflies in lilac and blue amongst the flowers. You don't get much brighter and more cheerful than our printable butterflies scene card - perfect for someone who needs cheering up, perhaps? This very colourful butterflies scene poster is the perfect partner to our caterpillars scene poster. How lovely would they look displayed side by side? This lovely butterfly alphabet can be used in so many ways, especially if you also print out our upper case and blank versions. This butterfly alphabet printable is pretty and useful for all sorts or projects! Children can make a banner of their name or a butterfly sign for their bedroom door. Pretty butterflies to print and cut out! Use them to make your own game board, for sticking, for writing on... or how about sewing a line of them together with simple running stitch and embroidery thread for a pretty butterfly hanging or mobile? Available in black and white and colour. Use our butterfly booklet to collect facts, spottings, drawings and other interesting bits and pieces. You will need our origami booklet instructions. I have one of these butterfly bookmarks marking the page of my diary – and it puts a smile on my face every time I see it! Once you cut them out you might want to laminate these butterfly bookmarks to make them longer lasting and protect the antennae. This printable butterfly jigsaw makes a quick activity for a rainy afternoon. 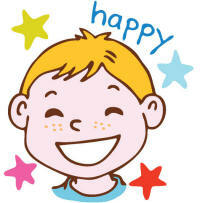 Print and cut out with the help of our instructions and cutting guides, tailoring the jigsaw to the age of your child. Here's a fun butterfly lacing card to print, cut out and laminate for developing fine motor control in younger children. This handy printable butterfly life cycle diary prints onto A4 paper, which you can then fold to make an A5 booklet. Use these butterfly lifecycle cards double sided to test vocabulary, or cut out individually for matching activities. To make double-sized flashcards, just cut around all the outer edges, fold along the vertical centre line and then glue back to back. You can see all of the stages in the lifecycle of the butterfly together on this lovely poster. Perfect for project books and displays! Our butterfly life cycle photo posters are perfect for classroom displays if you're learning about nature and life cycles. There are four stages in the metamorphosis of butterflies, and we've shown them all in a simple diagram on this printable life cycle poster. Display our labelled version, or print the blank version and ask the children if they can name each stage. This butterly life cycle poster shows the passage from egg to caterpillar, to cocoon, to butterfly. We've got a set of 4 lovely colourful posters - one for each stage of the butterfly life cycle - to print and display in the classroom. Choose from labelled, or blank versions below. This fun activity tests how much the kids know about the lifecycle of the butterfly. Print out the cards and the arrows, cut out (and laminate if you want to reuse them), then ask the children to arrange them in the correct order. This pretty mobile is a fun cutting and sticking activity for children - perfect for a wet summer afternoon, perhaps! Cut out each pair of butterflies and then glue together, trapping a piece of thread behind them. The butterfly on the poster is a lovely yellow and orange. 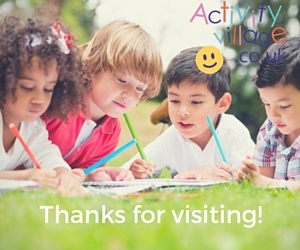 Print and display as part of a minibeast, garden, spring or summer project. This beautiful butterfly has been caught by the camera enjoying a summer flower. Print this lovely butterfly poster for your minibeast display. This printable butterfly template is useful for so many kids crafts as well as in the classroom or your scrapbooking projects. For a really quick craft simply cut out a number of different sizes, get the children to colour them in, and string up to catch the breeze in a summer window! 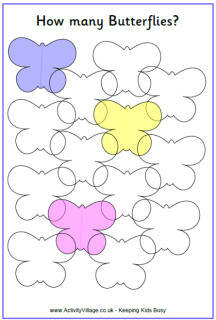 Here is another pretty butterfly template to print for kids crafts and other projects. There are multiple sizes in the pdf file below. A lovely rounded butterfly shaped template which is useful in all sorts of crafts. We've provided a variety of sizes on one page so you should find what you need! Here's a simple butterfly template to print for crafts, including our felt butterfly craft. Before children colour in our butterfly they have the added challenge of tracing the dotty lines on our cute butterfly tracing page. Two gorgeous butterflies flutter on this pretty writing paper, which comes in three different versions. Choose from three versions of this pretty butterfly writing paper: blank, lined or with handwriting lines. This butterfly needs some wings! Your children can have fun drawing and decorating the wings however they chose, or they can use our picture as inspiration. Encourage the kids to let their imagination go wild with this design a butterfly colouring page - or use the blank to study real butterflies and capture their markings. We've provided the outlines of lots of pretty butterflies. Now all the kids need to do is draw on some symmetrical designs and then colour them in! Have the colouring pencils ready. Once the kids have mastered our simple learn to draw a butterfly tutorial they will have fun creating lots of lovely coloured butterflies. Our tenth mask template has a lovely butterfly shape, so why not try using paint, sequins and pom poms to create a beautiful butterfly mask? You could also use pipe cleaners to make some antennae! Ths pretty lilac coloured printable scrapbook paper is covered in flowers and butterflies - so pretty for summer or any time! This printable scrapbook paper features colourful childlike flowers, a butterfly and a gorgeous turquoise background - so pretty! William Wordsworth's poem, To A Butterfly, is a lovely one to read with the children. Here is a pretty printable version.